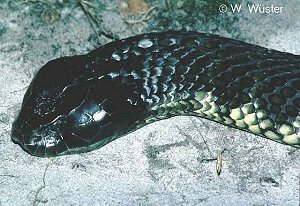 Largest race of tiger snake in Australia, muscular, robust bodied snake with a moderately short tail. Can grow to a maximum exceeding 2.40 metres ( average about 1.9 metres ). Head is moderately wide, depressed and slightly distinct from the neck. Eyes are medium in size with round pupils. Dorsal scales are smooth and semi-glossy in appearance. Habitat on eastern Bass Strait Islands is mainly scrub and heath and dense low woodland. Diurnal and crepuscular. Shelters under logs, abandoned Mutton bird nestling burrows, under rocks and in dense tussock vegetation . Usually sluggish, inoffensive and intent on escape if disturbed. If cornered it will hold the forebody in a tense but loose curve, head raised slightly and facing directly at an intruder, inflating and deflating the body and hissing loudly. If provoked it will strike forcefully. Feeds mainly on small mammals, lizards and frogs ( if available ). On islands with seabirds, mainly Mutton bird colonies, adults gorge on young chicks to build up reserves for the remainder of the year. King Island specimens are also cannibalistic. 75 mg ( dry weight of milked venom ), Worrell (1963 ) ( Ref : R000008 ). 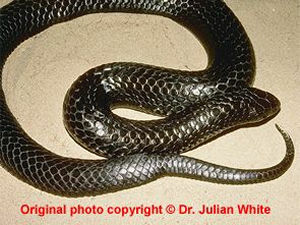 Tiger snake bites have a high potential for fatality and require urgent treatment. Most cases (all those with evidence of paralysis, myolysis or coagulopathy) require urgent antivenom therapy.